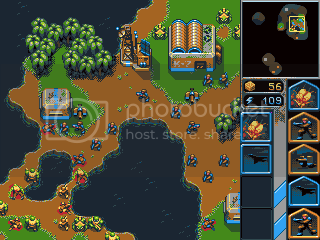 I had a dream that I was playing this crazy old-school real time strategy game the other night. I woke up and knew I had to pixel it! Using Arne's 16 colour palette for the fun of it. Was curious to see how well the palette could handle this kind of game. Cheated a little using semi-transparent shadows... but oh well There's going to be semi-transparency used for the build-progress overlays in the HUD, anyway. Interested to hear your thoughts. I'm mainly concerned with keeping everything distinct and readable. 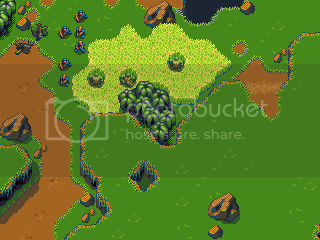 Trying to keep the tiles using the darker colours and the sprites get the whole spectrum to enforce pop. It only gets so far, which pressed me to put the shadows in. The game has 3 races; Mutants (green dudes), Humans (brown, pinky dudes), and Machines (blue grey guys (not pictured yet)). I'm trying to keep each race being recognisable by using consistent colours for them. There's already some of it going on with the human troops and buildings being mainly brown. Then there's the matter of having sufficient team colour on each sprite. I've only been able to work out 4 decent team colours, blue, yellow, white and pink. The rest are either too dark or clash too much with the race colours. 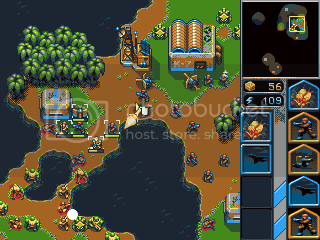 The little buildings are bunkers, defensive structures; the big building is a Barracks, which allows the production of infantry; and the building half off-screen is the comm center, which increases the production rate of power tokens (the blue buttons). I won't bother to go into the details of the gameplay because I am so... so tired. This is a fairly solid piece you have Eyecraft, hard to find any errors with it, hell the only critique I have is you should do a bit more with the water tiles, but it isn't needed since what you have is fairly effective. Whats the blank top-right corner for? You should put an avatar there or somethin, it'd be sick. Hurm didn't cross my mind when I wrote that post, but that very well could be. Looks like a cross between Chaos Engine and warcraft! Keep up the good work. Looks like something I'd definitively play. "God is dead, but considering the state of species Man is in, there will perhaps be caves, for ages yet, in which his shadow will be shown"
+ tree tiles (supposed to be like banana trees... just a tropical jungle sort of vibe). + more directions for human Gunner sprite. Tricky to get perspective and maintain readability. Also just want to note that the texturing on the HUD fill is still WIP. ...only critique I have is you should do a bit more with the water tiles, but it isn't needed since what you have is fairly effective. Thanks mate. I'm still pondering over that. I think the water at the moment strikes a nice balance between being identifiable ("hey, thats water!") and not being distracting or noisy, which is a constant threat with these 16x16 tiles. Still, I'm pondering... Oh and yes, I'm sure it's obvious now that the top right is the minimap. Believe me, I tried! The palette just doesn't like to play low-contrast around that value range. With the water it was possible because the darks are very forgiving. If I expand the palette later down the track, it will mostly be to add low contrast tones so I can do exactly this. Thanks . Yeah definitely has a strong WarCraft vibe, and I did get that feeling of Chaos Engine when I was doing the mutant Brute sprite. Definitely fun! Maybe try to stay away from texturing and go towards detail? A tile with some small rocks and one with flowers perhaps? The palm trees seem a bit too rubery methinks. Perhaps it's the green tone that gives it that appearance or perhaps it needs a bit more detail to look a bit better. 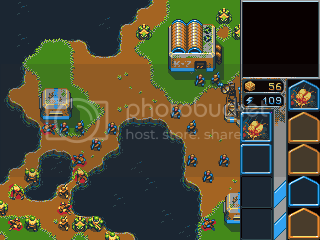 Now, take a look at this lovely screenshot from Cannon Fodder. I wonder how slavishly you intend on sticking to Arne's pallete. I feel on the whole this is far too warm and muddy.